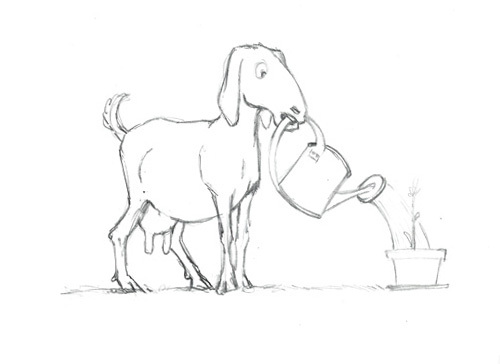 Before starting to add colors, I did some google image research on the coloration patterns of Nubian goats, and decided that I wanted a light brown goat with darker splotches and spots. Many of the goats I saw seemed to be darker towards the top of of their bodies, so I decided to paint the body of the goat wet on wet to get a nice transition of medium to light brown. This worked out pretty well, and then I was able to come in and add the coat pattern, and the body shading once it had dried. I haven’t done much wet on wet painting so it was good to do some experimenting. 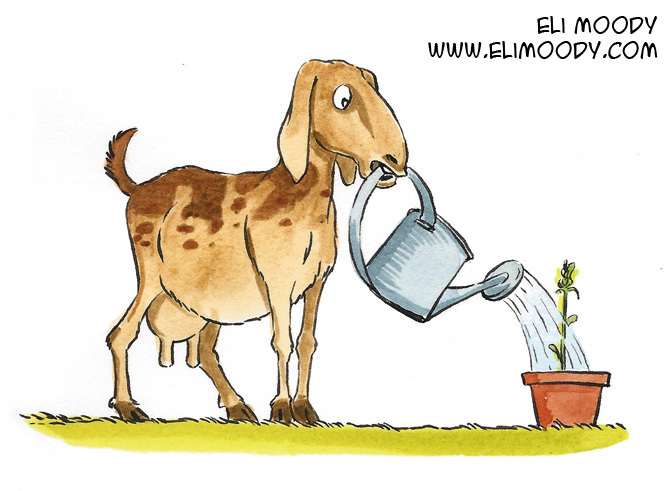 This entry was posted in illustration and tagged animals, eli moody, goat, illustration, pen and ink, pencils, watercolor, watering can. Bookmark the permalink.